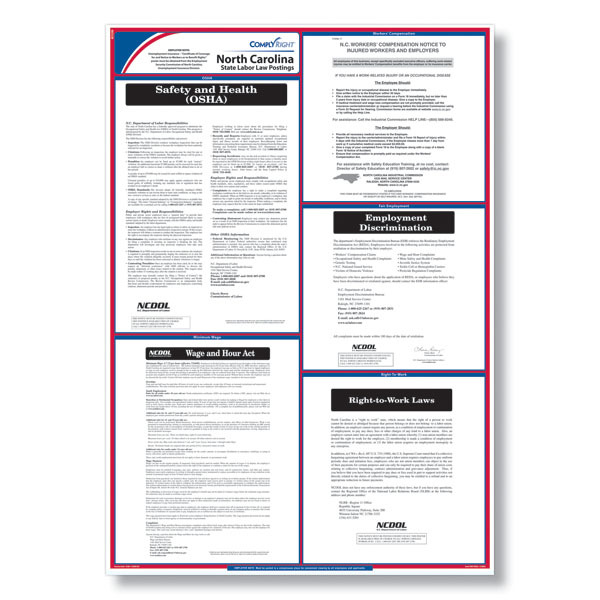 The ComplyRight North Carolina Labor Law poster provides worry-free compliance for every location in a convenient, all-in-one laminated design that makes meeting your state's posting regulations easy. 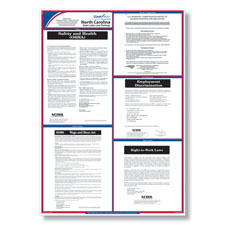 The North Carolina OSHA poster has been updated to reflect the federal OSHA rule requiring employers to inform employees of their right to report work-related injuries and illnesses free from retaliation. The North Carolina Minimum Wage poster has been updated with additional information on hazardous or detrimental occupations for minors. This is a mandatory change. The North Carolina Right to Work poster was updated with additional information regarding the payment of union dues and collective bargaining agreements. This is a mandatory change. Poster size - 24" x 34"